…the IronPigs once again pitched and hit their way to victory. It was the third in a row, and it allowed them to reach .500 for the first time in this young season. Mark Appel was the pitching story. He is as fun to watch as Eflin is, and was able to crank it up to 98 at least once, while also featuring a sinking power pitch at 89 which had many batters fooled. Add in the breaking pitch on the corners and he was dominant at the start–even striking out the side in the first inning. Something to watch: A criticism I heard is that he tires in the later innings. What I observed was that he seemed to be less effective out of the stretch later on, and seemed to shy away from his more electric fastball offerings. Was he tired? Does he have trouble with the stretch? Were they just working on breaking pitches in that situation on purpose (there were a couple mound visits)? No matter, it was a fine, fine outing regardless. On the hitting side, Sweeney, Featherston, Knapp and Perkins all had multi-hit games. 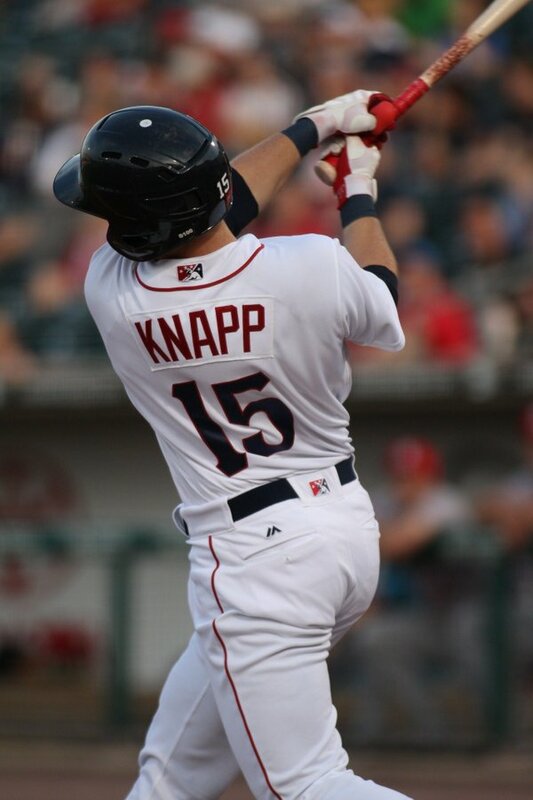 Knapp and Sweeney added long balls. It seemed like they could have maybe scored more, having left a few on base, but perhaps a conservative plan was in order playing situational baseball with the pitching looking so good. Luis Garcia got off the schnide pitching two innings of two-hit no run ball. Adam Morgan: The Phillies could benefit from the lefty; he’s pitching well–and he has the experience. David Buchanan: Again, he’s familiar with the territory, and the Phillies might want to see how he looks this season and make a decision on how he fits into their future. Mark Appel: He’s older than Eflin and has more AAA experience. Zach Eflin: He’s this far down because he’s young, and I think the Phillies would like to see him make more than two good starts at AAA before giving him the call. He’s still gaining feel for his curve, which has been excellent. Jake Thompson: He’s coming off a bad start, and like Eflin, he’s young and doesn’t need to get yanked around. Syracuse is still in town–they’ll head up there for a double header tomorrow and another game on Thursday. This is the final game of this season-opening home stand! David Buchanan is on the mound for the IronPigs to face RHP Taylor J. Jordan, who pitched five innings of 1-run ball versus the ‘Pigs on “empty stadium day” and blanked Moosic his last time out. Excellent seats still remain for tonight’s contest, and the weather looks great. 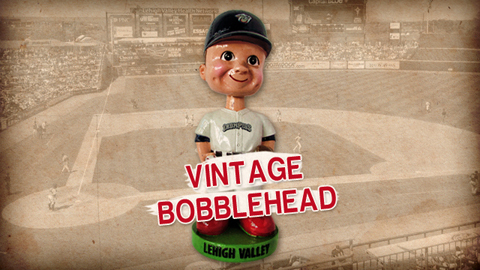 If you get there early, you’ll get a vintage bobble-head (seen below). The IronPigs have waived “web fees” for tonight’s game, so you really have no excuse! Kram’s Korner is a place for me to vent, opinion-ate, praise and grouse. Maybe about the team or maybe about things going on at the park. Even with the three wins in a row, I’m still going to the park hoping for a win every night. While that’s better than “no hope,” this season could possibly get to the point where I’m going to the park expecting a win each night–just going to see how they’re gonna win, not if. Also, I didn’t enjoy the guy behind me spitting on me last night. Link or links will be provided to help you read up on players and issues pertinent to the game. Sometimes we’ll link our own stuff, other times we’ll link beat writers who watch the team with us every day and write. Very seldom will we ever link anything here by a national writer or one who doesn’t cover the IronPigs on a daily basis. The IronPigs have six homers in ten games. Last season it took them 27 games to get 6 HR. The IronPigs have seven errors in the past four games. PS: No one from the secret email list took me up on my offer, so I’ll put it out there: Anyone want two tickets to Reading this coming home-stand, Saturday-Tuesday? Hit me up. Second row.